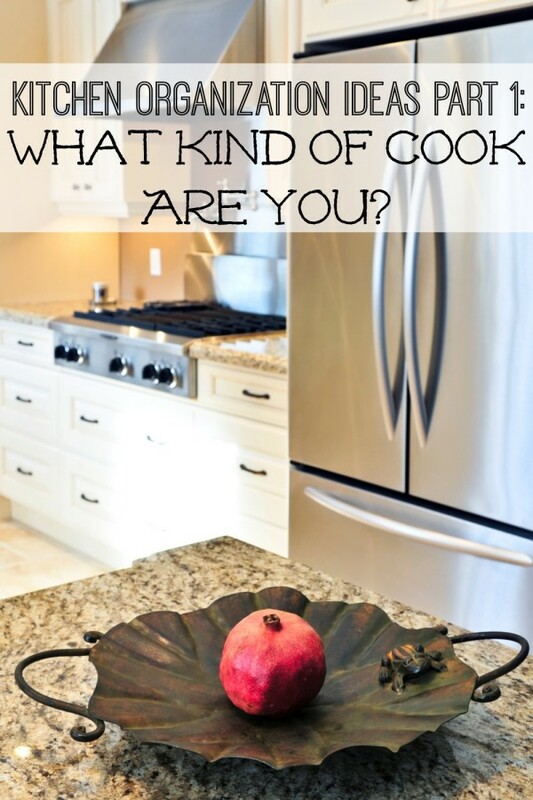 Kitchen Organization Ideas: What Kind of Cook Are You? 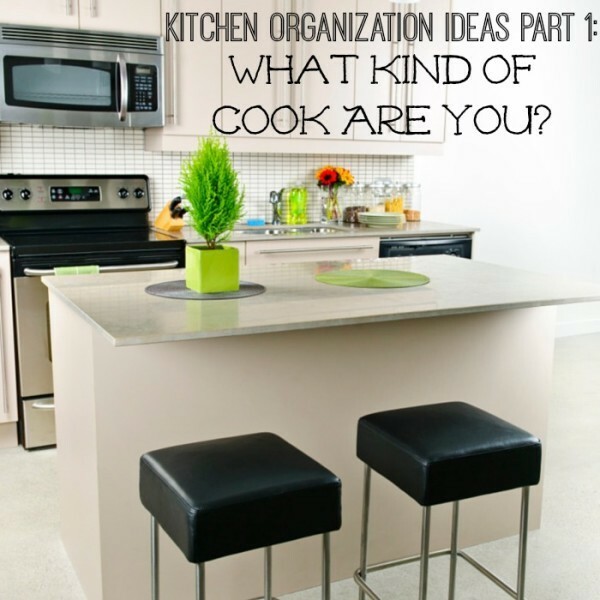 Kitchen Organization Ideas Part 1: What Kind of Cook Are You? Are you looking for some kitchen organization ideas? Welcome to my kitchen series! Read on to learn about some fantastic solutions for your organizational needs. Kitchens have changed drastically over the years. Way back when, kitchens were designed to be closed off from the rest of the house. There was only one tiny entrance and the kitchen was enclosed with four walls. The only person that was supposed to be in the kitchen was the cook. Not any more! These days kitchens are the hub of the house. Houses are built with an open floor plan and the cook wants to be apart of the action while doing his/her thing in the kitchen. When entertaining, the kitchen ends up becoming the spot where everyone socializes. Often times the children do their homework there, or sit at the island and have a snack after school. You may even find a small built-in desk with a computer and the kitchen is also a mini-office. It’s THE room in the house that becomes a little bit of everything. Needless to say, in most homes, the kitchen is a very important room that serves many purposes. That’s why I’ve decided to devote the next 5 Mondays to the kitchen. How many times have you been whipping up a meal and you find yourself rummaging through that crazy drawer looking for the measuring spoon? Or, maybe your kids are in the kitchen a lot and are constantly having to ask you for help to reach things. Or, you are ready to sit down and have a nice glass of wine and you can’t find the cork screw. I could go on and on, but I think I’ll stop here. I’m going to take you on a little journey of making your kitchen an efficient place in your home. Once you organize it to suit your family’s needs, you will never want to go back to the way it was. Back in 2006, I came across an article in one of my favorite magazines: Real Simple. On the front cover of this October issue was the title Organize your toughest room: 4 smart, real-life kitchen systems. What they did, was lay out the 4 most common cooking styles and show you how to set-up your kitchen for your style. The four different styles are: The Daily Cook, The Sunday Cook, The Come-On-In Cook and The Entertainer. This is when I started looking at kitchen organizing different and realized that different kinds of cooks, have different kinds of organizational needs. I thought this was a brilliant idea because they tried to reach everyone. Except for those “I-try-to-stay-out-of-the-kitchen-as-much-as-possible” people. For you, I’d organize your kitchen this way: one bowl, one plate, one spoon, one fork, one knife and one cup, all in one cabinet. I think that about covers it. So what I will do each week, is take each kitchen style and go through the steps you need to take to make it flow and work for you. For this first feature, all you need to do is figure out which kind of cook you are. The Daily Cook – You’re in the kitchen every day, whipping up the lasagna, the roast, the tacos, the chicken fingers…For you, an efficient setup is all about access and speed – quick in, quick out. The Sunday Cook – When you’re too busy on most nights to cook, one weekend session-making dinners in bulk and freezing portions for weekdays-reduces daily stress. Your kitchen setup should facilitate that. The Come-On-In Cook – Some cooks want to be alone. You prefer to share conversation – and clean up – with a friend, a mate, your kids. For you, the goal is to arrange things so that two (or five) can work as efficiently as one. The Entertainer – If you’re a cook who enjoys performing before an audience, all the kitchen’s a stage. Your goal? To create an illusion of effortlessness that bellies a tightly organized support system behind the scenes. So, which cook are YOU? I’m so excited to take this journey with you and give you some kitchen organizing ideas that will help relieve some stress in the kitchen. Next Monday we’ll dig into organizing a kitchen for The Daily Cook.